For the love of bunnies, zombies and frocks! 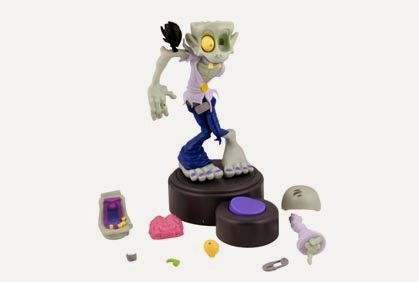 : Zed the Zombie wins award! Zed the Zombie wins award! Everyone loves a winner so lets give a hand to Zed the Zombie! The Australian Toy Association (an organisation I have never heard of until yesterday) has given Zed the prestigious title of Games Toy of the Year 2014. And when I say give Zed a hand, I mean it. Poor Zed has risen from the dead in pieces and your task is to put him back together in a race against time! I am not sure what happens if you run out of time but I real hope it involves body parts flying around the room. With Christmas fast approaching this is a great opportunity to teach the little ones all about zombies. Although putting zombies together seems to be the opposite of what you need to do in a zombie onslaught. Produced by Moose Games Zed is available at all good toy stores, and a few of the bad ones too. Our BZF Halloween Haunted House!